Matt Mitchell at bluewhale in Los Angeles on Sept. 17. Some jazz welcomes you in. Other jazz seems to announce, "Now this is happening, with or without you." Pianist Matt Mitchell's work as a sideman — with trumpeter Dave Douglas, saxophonists Tim Berne and Rudresh Mahanthappa, and many others — spans this spectrum, but when he's the one in charge, there's a good chance you're in for the latter. His music is, simply put, a handful. His 2013 debut as a leader, Fiction, stands as one of the most uncompromising and unclassifiable entries in the catalog of Pi Recordings, a bellwether label in the jazz vanguard. A series of "musical puzzles" played by Mitchell and drummer Ches Smith, it pulses with an obsessive complexity: robotic prog run amok. 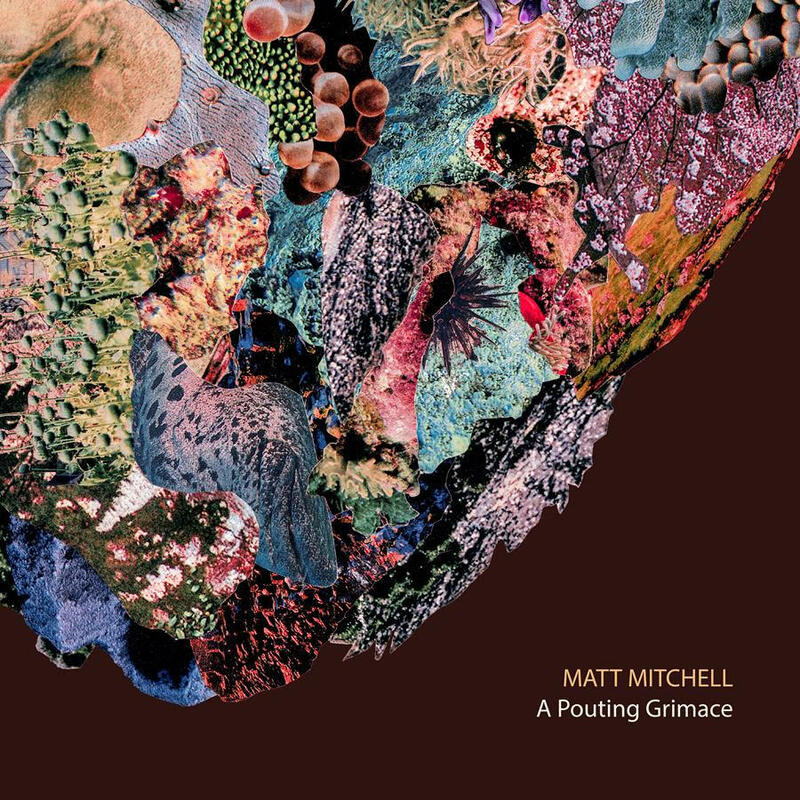 Mitchell's latest, A Pouting Grimace (due out on Sept. 29) is both his weirdest and most welcoming statement to date — and easily his best. The album takes his core trio, with bassist Kim Cass and drummer Kate Gentile, and adds a wild menagerie of sound, yielding a kind of mutant chamber jazz scored for 12-piece band. Phrases zip, stutter and lurch, as striking instrumental colors — including Jon Irabagon's sopranino sax, Sara Schoenbeck's bassoon, Scott Robinson's bass sax, Mitchell's Prophet 6 analog synth and Dan Weiss' tabla — leap out of the mix. Mitchell's mad-scientist compositional sense is still on full display, but the album finds him playing with texture in a way that often feels downright gleeful. Along with his deep immersion in jazz and contemporary classical music, Mitchell is a passionate fan of heavy metal — in particular, its more feral and outré extremes. He was a natural interview subject for Heavy Metal Bebop. So we met in Brooklyn last August to talk in depth about jazz and metal. A follow-up email Q&A, in which Matt discusses A Pouting Grimace, appears as a postscript to the main interview. What was your introduction to metal? My entrée into metal, as I think it might have been for some jazz people, was actually via John Zorn and Naked City. I was in high school when Naked City was happening. I never saw them, but I listened to them incessantly, especially the Torture Garden tape. My senior year of high school was the Torture Garden tape and the first Mr. Bungle album, at the same time as a lot of Frank Zappa stuff that I was getting into. That's basically how I even heard of bands like Carcass and Napalm Death and whatnot. And then a friend of mine named Matt Johnson — this was back when you made tapes for people — he made me four full tapes, like 90-minute tapes; basically he made a metal comp for me. He titled it "Death Is My Life." He was a huge, huge metal fan. He was, like, the metal guy. He was a year ahead of me and it was like the last month of high school for me, and that's where I first heard bands like Death, Napalm Death, Bolt Thrower — he loved Bolt Thrower a lot. He was super tapped in. This was when, like, Nocturnus was a thing. The other day I just kind of came across that name, and I was like, "Oh, I remember listening to them back in the day." He loved Morbid Angel too, of course, and Entombed. Obituary was an early one as well. Have you always been into the extreme stuff, or did you go back and check out things like Metallica? I did. I never bought a Metallica album, but I've listened to them. They were kind of more around. A lot of my friends knew about them. I definitely liked them. I probably would appreciate them the most now, but I tended to just go for the more extreme stuff. I just wanted stuff that scared me a little. I still want that. I was sort of the same way — it was a pretty straightforward path for me from liking Poison in fifth grade to liking Morbid Angel in 10th grade. And then with all the punk stuff in between. Sure, I listened to that too. The girl I was with for a while was into Sonic Youth big time. Obviously they're a little different, but there was a lot of punk in there too. Then I got Gorguts' Obscura right when it came out, and that was, as most metal people know, super significant. I think I got into Cryptopsy around then too. So that was awesome. And then later Pig Destroyer and Agoraphobic Nosebleed. Cephalic Carnage I got into. I still like them. I guess they're still together but their last album was four or five years ago, but I still think they're pretty happening. Around that same time I got my first Deeds of Flesh album, Path of the Weakening. And then I got She Lay Gutted by Disgorge. So that was sort of the "brutal death" entry for me, whatever that means. I like Nasum, and early on I was into Brutal Truth. And their reunion albums are happening. They're pretty strong throughout their whole discography. The album for me by that band that really hit home was Sounds of the Animal Kingdom. You could almost say that's like their Sgt. Pepper, or whatever. Super expansive. Man, it's so awesome. And the EP that came before it, Kill Trend Suicide. Was black metal a thing? I dipped my toe into that a little bit. I found it hard to find bands I liked as much in that style. That seemed to be an area that was slightly more concerned with image than musical content. That's putting it really simply. I did find some that I like. I like Darkthrone. I like Mayhem — I love that album De Mysteriis Dom Sathanas. And some of their later stuff is super killing too. Like Ordo Ad Chao is out there. Ches Smith was telling me that they produced the album themselves, so Mayhem, at least with that lineup as it was at the time of that record, that's their unfiltered-by-a-producer vision. Left to their own devices, they made their most bizarre album. Part of what's interesting to me these days is, with bands like Portal and some of those Australian and New Zealand type bands, is they sort of bring what I like about the black metal into it, the atmosphere. But of course a lot of that is because it's just sort of descended from Incantation. Really, Incantation's clearly, to me, one of the granddaddies of that whole sound. Do you know Jute Gyte? I guess it's technically black metal. It's one guy who lives in St. Louis; he's super-prolific, and he puts out two or three albums a year. He plays a microtonal guitar, a 24-note-per-octave guitar, and plays crazy harmonies too, inside that. It's already super-chromatic. It's not just your typical minor-triad kind of black metal. Harmonically it's super, super sophisticated. Sonically, it's pretty bizarre too. Even the fact that it's a drum machine, he uses that sort of like a creative advantage. And every third album is, like, this weird electronica that has almost nothing to do with metal. He has so many records, but it's all on Bandcamp. He's a guy that is just totally standing alone in a weird way. It's really compositionally substantive. Even somebody that loves contemporary classical music, like I do — I mean, this guy clearly studies that type of [stuff]. Even now he's getting into polyrhythms, like having whole sections where it's two different tempos at the same time. 'Cause he puts notes on each one of his Bandcamp album pages. He sort of nerds out a little bit, like, "This tune I used this." So it's like 12-tone and rhythmic canons. But it's also just super evil-sounding black metal too. And Craig Taborn turned me on to Virus. He loves Virus and he got me into them. Yeah, that music is really odd. I don't even know what to call that. Yeah, I guess you can see how it might have been related to metal at one point, but it's just weird, like, art rock. But the guitar parts are super substantive. There's a lot going on there, harmonically; the tones are really cool; the production is super well-considered. My mode a lot of times is just to put on my metal, either on my iPod or on my phone, in one playlist, and I just shuffle it just so I don't have to choose. But then a Virus song will come up and I'm like, "I'm still in brutal mode and this is awesome but..." I tend to skip the Virus tunes and then just listen to them separately, by themselves. It's like if Bowie made metal, or something like that. How did listening to so much metal affect your development as a jazz musician? I was talking to Kim Cass, the bass player, 'cause he comes over to shed and rehearse a lot. I remember him saying to me — I'm sure he won't mind me saying that he said this, but he was like, "Man, I just don't know how to access this stuff." And he's a bass player, too; he can play electric bass. But he's just a total complete upright-bass virtuoso, plays any conceivable style of jazz you can imagine super, super well, but has been getting into metal also. I'm not sure if he's been listening to it quite as long as me, but he might have been. But we were talking like this, like how do we... It's not even something I know that I've figured out, how to deal with it. I think looking back on some of the music I've made, there's maybe a connection with the type of jazz that, for lack of a better term, deals with composition in a certain way and has sort of loping bass figures that might have — not heaviness, but sort of like a groove concept, laying into a rhythmic grid in a certain way. I have some tunes where, it's not like I'm setting out to write a metal tune; I definitely don't do that, like where I'm going to play metal tunes on the piano or anything like that, but rather sometimes, some lines, especially in the lower area of the guitar, or a downtuned guitar register might sort of... You could give it to a couple guitarists and some loud drums, and it might work that way. But there's something about metal, especially death metal and that kind of stuff — not to be all intellectual about it, but there's some kind of rigor to how the riff structures go, how they develop, or the way one comes after another, or in terms of pitch, the way stuff happens. And that combined with a sort of directness of purpose, or something, I think [has been influential]. I think the connections are sort of more ethereal for me, in a way. Also, like, in terms of intensity. I love music that's more mellow too. I'm a huge Morton Feldman fan, which is like the opposite complete extreme, although interestingly, after listening to metal for four hours the other night, it was late, and I just needed to cleanse my palate, so I put on the second string quartet of Feldman and it almost kind of totally just fit because it was still these little figures that repeated in weird ways; it was just being played by a string quartet. [Laughs] It was almost like inverted metal, in a weird way. [Metal is] music that deals with basic parameters of music in a sort of elemental way: pitch, rhythm, form. And a lot of the other music I like sort of does that in a clear way too, whether it's freely improvised... Like, Evan Parker, to me, does that. One reason I think Evan Parker, especially his solo soprano improvising, is so compelling is because it's so well considered. He's dealing with music in a sort of abstract zone. Abstract in the sense of, just dealing with pitches and rhythms and sound. And to me, what I like about metal is, it deals with that in a really specific way, and that sort of affects how I like to improvise. It's just a directness, a conciseness — like, “Boom, we're just gonna hit it right now.” It doesn't necessarily have to be concise in the sense of, like, we're only gonna play for 90 seconds, but it kind of gets to the point. You don't get the sense that it's noodly or searching. Even it's long improvisation, there's a path, sort of like an inexorability about it. But yeah, it's that sort of thing, just sort of like a clarity. Even when it's sonically not clear, like a Defeated Sanity record — some of those, especially Psalms of the Moribund, I have to really stretch to hear what the actual pitch content of some of those things are. But that's part of what's appealing to me. But even if you can't tell the exact pitch content, you can tell the relative... you can tell that there's, like, clumps that happen next to each other, in time and/or space. And also with a lot of those bands, just the way they each kind of set up their own certain problems and solve them kind of in the same way each album but a little better each time. You get into a different band and it's just like, how does that band deal with the problem? You check out Ulcerate: OK, they started off more a little Immolation-y, maybe... You follow it all the way through and it's like, oh, they're really refining things in a certain way and they sort of expand within that. It's like a lot of composers — after a while, you're like, OK, over time, you can really tell this is the same composer, like Feldman, Xenakis. I don't know what the breakdown is for a lot of these bands, but a lot of times, the compositional efforts are sort of group-based, which is kind of interesting. This hits on one of the things I love about metal, which is these large discographies and just that idea of micro-refinement. You mentioned Obituary before, and their albums get to a level of development that basically wouldn't even be apparent to most people because they basically don't ever change. I saw them play in Rochester in, like, 1997 or '98. Nice! That's an underrated period for them. Back From the Dead! That's a great album. I had a Back From the Dead T-shirt. Isn't that the album that has the rap track at the end? It is! And there's a really good live album to come out of that which is just called Dead. When you get these bands that have 10 to 15 albums, that's when it really gets interesting: There's something about how metal bands just kind of dig in, because there's never really a hope of transcending the underground; that's not even a goal. That brings up an interesting thing too. This is kind of speculative; I'm just sort of inferring it based on reading occasional interviews with people in these bands. But it seems like there's a not-too-crazy analog with the life of a jazz musician. Because a lot of these bands don't quite make a living doing what they do, so they're not beholden to anyone; they just do what they want. So they just stick to their guns and they just do it out of pure... It has that special kind of dedication that you do when you're desperately trying to fit in music with a day job. I kind of know what this is like, from having had a day job, where you're just trying to stuff it in. It lends a certain urgency to it. And if you're a group of four or five people with that sort of common purpose, you're all, like, this band is your life. You mentioned Immolation, and for them, I know that's the case. I think one of the guys drives a truck and one of them does sound for events. Yeah, it's one of those things where they're just like regular dudes here but then they go over to Europe and headline big festivals. Which, again, there's a long jazz tradition of that, too. But it's much different: It's rarer in metal to have [a musician who's in multiple bands]. Like, I can say I'm a member of eight to 12 bands. Some of them work more than others but none of them I can make a complete living off of. And that's kind of why I am a member of these bands too. I think except for your kind of rogue guitar-hero type, or your drummers who tend to play and be the session-drummer types, it's a little rare. You're just in one of these bands. Yeah, by and large, rock is about stable lineups, and jazz is a mix-and-match thing. In jazz, somebody's greatest record could be a record that's not their own album. Like, is the best place to hear Tony Williams on a Tony Williams album? You could make a case that the best Wayne Shorter ever is Live at the Plugged Nickel. I'm not saying I would definitely say that but I've heard some people say that. I like Miles Smiles as a Wayne Shorter record as much as I like Speak No Evil, or something. I got into those records when I was definitely no older than 14. I just found my way to jazz around when I was 12 or 13. So I started getting these albums on tape, 'cause we're talking 1987, '88. Back then, the attraction for me was Herbie Hancock, period. I mean, I loved all of it, but it was just like, "I want to hear Herbie." I would read reviews, I would read books about jazz, and I just somehow found my way to this or that record, and I was like, oh, Herbie Hancock, yeah, I love him. And oh, he was on Nefertiti, so I'd go to that, and then, after a while — it didn't really take that long — I still went to it for the Herbie but obviously then it was, like, the way Tony Williams played. People don't talk as much as I think they should about Miles' actual playing on those records. Especially Plugged Nickel, I think he gets short shrift, even though he was definitely in pain a lot when that date happened. But I love how he actually plays the trumpet; the improvising he does on the trumpet on the Plugged Nickel sessions is completely bizarre and awesome to me. That was a little bit more of a later... like, oh, man, I've been sleeping on this even though I've been listening to it constantly. Yeah, I think in a lot of ways, good jazz records are inexhaustible. You can just focus on someone else, throughout the whole piece. Being a fan of jazz who's not a schooled jazz musician, that's what jazz is to me: it's combinations of different voices; just learning what a musician sounds like, and then what does that person sound like with all these other players. It's definitely an appeal for the “schooled” jazz musician too. For a musician who's spent his life learning how to play it, that's sort of inevitable because assuming you still do it after 30 years, assuming you're still bothering to try, it's because it appeals to you on some level. I transcribed a lot of solos for five to seven years or so — like, age 15 to 20, 21. And then I kind of just stopped. I didn't stop listening to jazz; I just stopped writing down the solos. Because at a certain point, you have an idea how to connect notes together, and then it's just getting your technique and then just figuring out your way of connecting the notes. But my listening then just kind of entailed zooming out a bit, and just listening in this way, like a little bit more of a grander scale. Kind of like a more aerial view, perhaps — like, contour of a solo, or character, or even more abstract concepts than notes. Similar things like that. Almost to the point where it's like, I'm trying to avoid being so lost in the thicket of the nuts and bolts of it. Even though that absolutely appeals to me. I just do that when I compose. That's when I allow myself to do that. I write something super, super specific, it might be really hard to play, and then I learn how to play it, and then I just decide how to be free with it. Just kind of kick it around a little bit. Also, the notion of hearing stuff, it being inexhaustible, I've been experiencing that a lot lately because I've been having these listening sessions with Dan Weiss. He got some good speakers and a nice record player, so he's been getting back into vinyl, so we've been just listening to stuff we've known separately forever, but now that he has this nice system, we're checking it out. So he'll text me, like, "You have to come hear Nefertiti on the system." If there's an album I can say I know like the back of my hand, that's one of them. And then hearing it, it's just like, oh, my God. Hearing Ron Carter on a good vinyl pressing, for instance. The other day we had a hang with him and Jon Irabagon and Ben Gerstein and Todd Neufeld and me and Dan, and we listened to [John Coltrane's] Impressions and [Sonny Rollins'] East Broadway Rundown. Albums that everyone knows, but also several people listening to an album that they separately are way into but haven't listened to together, that's a whole thing. it becomes like a little mini hive mind of the room, in terms of the vibe of what you're listening to. Yeah, it's an underrated and underutilized thing, to listen with other people. My listening is often so private. So much of this extreme metal stuff, unless you're in a very specific environment, you're not exactly going to blast that over speakers. Yeah, and I find myself reluctant to bring it up too. Obviously I'm in no way embarrassed about liking it. It's just you have to then go through a whole thing about explaining... Like, "Oh, you like metal?" And then you're like, "This band, this band, this band" — just total blank stare. Sure [laughs]. I was thinking about that on the way over, how taste in metal is so [subjective], because of the total vastness of metal. That sounded so ridiculous: Because of the total vastness of metal. But it is. Because there's so much of it, the tastes from individual to individual can vary so much. You could take 50 bands and make connections between any grouping of 10 of them and have them make sense, and one grouping can appeal to one person and totally not to another. Right, and also, in terms of my own listening, I like bands that have opposite qualities: a band like Necrophagist, where it's incredibly complicated and air-tight; I also like a band like Revenge. Extremely filthy-sounding, kind of the border of black metal and death metal. One thing that what you just said made think of is, some music hits the spot because it matches something that I feel like I want to hear, but maybe I don't know in what form it actually exists. There's some jazz that I have encountered that did that for me. Nefertiti somehow was like that; [Cecil Taylor's] Conquistador and Unit Structures were like that. A lot of those Blue Notes were like that. [Eric Dolphy's] Out to Lunch was like that. When I heard it, it was instantly like, oh... That could be just because the music is so well conceived, it's convinced you that you've been waiting to hear this. That's a pretty ethereal thing. But some metal, like, say, by the time I heard Meshuggah, it was like, oh, OK, this totally makes sense, someone dealing with rhythm in this way, playing heavy music that's still fundamentally, like, basically rock music, super-heavy rock music. I remember hearing that and I was like, "Wow, it took this long for some guys to do this." Yeah, I really liked what you said about how often metal bands will come up with a certain problem and just try to solve it again and again; Meshuggah are like that. I kind of took them for granted for a while. Me too. I take them for granted because Dan is one of my best friends, and he is probably the biggest Meshuggah freak I know. I totally think they're great also, but his fandom just makes me look like a poseur with regard to them. So they're never quite as far from my mind because whenever we talk about metal, it's one of his favorites. It's funny 'cause that new track the other day, I listened to it and I was like, “Yep, it sounds like them, but a little bit of a new twist.” I could smell the [Allan] Holdsworth-y solo coming a mile away, but that's cool; that's one reason you go to them. Yeah, it's a strange thing. You can have this taste for “weird music,” but with a band like that you don't want them to not sound like Meshuggah. Which begs the question of, how much challenge are we actually looking for? Sure. I don't need them to be Defeated Sanity or Cenotaph. I have those bands for that. And then you go back to Meshuggah and you're like, “Oh, on a certain level, they don't ‘play fast.’” They do play fast, but in the sense of the bass drum. This is a super-obvious observation but it's mostly just about being groovy for them. Basically they do all the rhythmic [stuff] that the other bands do, but there's always a snare on three. The singer turned me off for a while. The delivery is just so flat. But I guess it's supposed to be. This actually came up recently too. Basically what Kim Cass and Kate [Gentile] and I will do when we shed or rehearse, we'll play for a while and then we take a break and lately we've just been putting on metal when we have a drink, or whatever. I'm sure Kate won't mind me saying that we were talking about Meshuggah and she didn't really get the vocalist either and Kim was like, “Yeah, but you wouldn't really expect to hear one of those overtone-y growls like Lenzig from Cephalic Carnage would do — that wouldn't really quite fit.” Now that I say that, it would be interesting to hear. What's weird is lately it took me aback how clear they are, how much I can understand the words. Yeah, and also it's that kind of metal singing where there's no sense that there's anything emotionally on the line. He's just kind of making sounds with his throat. As opposed to a lot of metal, where it seems like the vocalist is dredging up some element of their soul through performance. I know what you mean. [Meshuggah's vocals are] more like an instrument. [Gorguts'] Luc Lemay would be someone where, there's a lot of soul. There is. And the vocals are different from record to record too. That could be ... I don't know how old he is. He's got to be close to 50, or over 50. Sorry to age you, Luc! Man, Obscura came on the other day. I've had that album for almost 20 years, since it came out, and it struck me how totally [crazy] that album is. It's so bizarre. [Laughs] It's really out there, man. And I basically live off of weird music, and that's, like, still... even in metal, there's nothing that quite goes that far. Can you talk about how this latest wave of metal listening that you were in the midst of when we spoke in 2016 might have informed the writing or playing we hear on A Pouting Grimace? With this project I definitely didn’t set out to write “metal-type tunes,” though in retrospect there are elements that come to mind with three of the pieces: “plate shapes," “brim," and “heft." “Heft” is probably the most overt nod to my love of some doom metal and slower type things. The other two pieces I’d say are relevant in the sense that they deal with repetition of material in a sort of riff-like fashion. Obviously that’s far from the sole province of metal, but I’d bet that the way it manifested in these pieces is somewhat related to the various sorts of heavy music obsessions I’d be inundating myself with around the time I wrote the music. 1) Revenge, any of the records. J. Read’s drumming has to be heard to be believed, and I love the extremely raw energy. 2) Martire, Brutal Legions of the Apocalypse. An Australian band, chaotic energy, buzzsaw guitar. 3) Encoffination, III: Hear Me, O Death. Guitar/drums duo, slow and doomy, like Incantation on extreme depressants. 4) Impetuous Ritual, Blight Upon Martyred Sentience. One of my favorite bands, dark and evil sounding. 5) Grave Upheaval, self-titled. Australia again, shares personnel with Impetuous and Portal. The “cavern-core” approach pushed to an extreme. 6) Pissgrave, Suicide Euphoria. Philadelphia! Crushing. You don't strike me as the kind of musician who's interested in overt genre hybrids, or genres at all, as far as your own work goes. There are obviously elements of jazz, contemporary composition, Indian classical, etc., on the new album, for example, but it doesn't seem like any kind facile "fusion" is the point. That said, could you ever see yourself incorporating a metal influence into your work in a more straightforward way? I’ve thought about it. You’re definitely right about not caring about genre hybrids per se. What interests me are dealing with the elements of music on an abstract, elemental level: notes, rhythms, etc. More like cross-breeding rather than Mr. Potato Head-style, slapping jazz ears and glasses on the metal body, so to speak. I’d likely approach such a project more as a “heavy music” concept, not beholden to this or that subgenre of heavy music, nor beholden to specific types of improvising. But I definitely fantasize about a very loud project somewhat in that vein. Matt Mitchell has a rare depth of insight on the music of saxophonist Tim Berne — not only as the pianist in Snakeoil, one of the most accomplished bands of Berne’s career, but also as an aficionado, and maybe even an obsessive. All of which is glowingly apparent on førage, a deep-focus, often astonishing album that features Mitchell’s solo piano readings of Berne’s compositions.